The birthplace of wheelchair sports stands on Guttman Road in the town of Aylesbury in Buckinghamshire. This address is a permanent memorial to the man who identified the role that sport could play in rehabilitating patients at the nearby Stoke Mandeville hospital that specialises in the treatment of spinal injuries. No doubt Sir Ludwig Guttman would be rightly proud of the Stoke Mandeville Stadium, given the superb facilities that it offers wheelchair users both in terms of training for and competing in the sport of their choice. Take just a few examples: five-a-side football, archery, badminton, table tennis and indoor bowls. They are all catered for. The stadium’s place in history has been cemented by its role in the birth of the Paralympics, which are now held in parallel with the Olympic Games and the Winter Olympics every four years. The first such meeting was held at Stoke Mandeville in 1984, and in just over 20 years they've grown into one of the worlds major sports events. Of course, reaching the standards required to compete in the Paralympics requires not just a high level of ability but also a great deal of dedication to training. Such development has been aided by the emergence of both national and international meetings that sharpen the competitive edge of individual athletes as they build towards each Paralympic year. 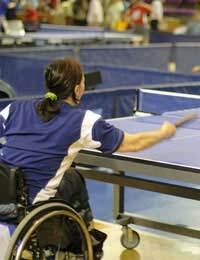 But for every wheelchair competitor of international standard, there are thousands who enjoy their chosen sport simply for the pleasure of competing. And just as the facilities at Stoke Mandeville have been developed, so smaller-scale investment in local areas has been reflected in an increase in opportunities for people to join in. There are lots of sites on the internet and organisations that can help you get started, try your local directory and search engines. Each group will not only offer an introduction to the individual sport but also provides contact information for national co-ordinators together with links to associated websites. What you are looking for is a sport that excites your interest and which is played in your local area in order that distance doesn’t prevent you playing as often as you would like. The more ambitious should take a look into more professional and advanced teams. Anyone who doubts the sporting opportunities open to wheelchair users should take a look at the events listed: in the summer games, for example, the British team competes in powerlifting, rowing, cycling and judo, to name just a few; in winter, alpine skiing and hockey are two of the disciplines. Given the high skill levels and fierce competition which are required to compete at this level, it is clear that wheelchair sports are no patronising sideshow; rather they are evidence that disability doesn’t necessarily mean that an individual should be relegated to the sidelines.